Choosing new trees, shrubs, annuals, perennials, and vegetables in the spring is a fun activity for most of us. Planting gives you with a sense of accomplishment. But now it’s hot, dry, and just like you your plants get really thirsty when temperatures exceed 90°. Follow these tips to be a good plant parent during the hottest days of summer. Plants crave warmth, but too much takes a toll on them. Dry plants will often show signs of heat damage: wilted, yellow, or crunchy brown leaves. Trees and shrubs leaves/needles will begin to brown and drop. Vegetables may fail to produce, drop their blossoms, or show signs of blossom end rot. Of course, the most straightforward way to hydrate plants when you see warning signs is to water more often. Water slowly and deeply so that the liquid has the chance to reach every section of the soil and roots. Soil that has gone completely dry can begin to repel water, but watering slowly encourages soil to begin absorbing liquid again. Mulching keeps plants cool and prevents moisture from escaping. Plants that bloom in July and August need extra water when the climate gets really dry, but many are equipped to survive the heat of the summer. Early spring blooming perennials suffer the most when the weather is at its hottest. Assist them by cutting off blossoms and stems that have finished blooming. Remove excess foliage that looks damaged and brittle. Plants will shift their energy toward their root system. Annual beds may need refreshing with new, heat-tolerant annual varieties if you wish to keep color throughout the growing season. Container plants need water regularly this time a year, which may be daily depending on the ratio of container size to root ball. If possible water in the morning or evening so the moisture has a chance to absorb. 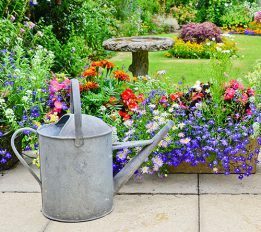 If the top inch of soil is dry, the container plant needs to be watered. Continue to pour until water begins to leak from the drainage holes. In extreme cases of drying out, you might try submerging the container into a tub of water for a half hour. This will jump-start the absorption process. Hanging baskets also dry out quickly, and it’s easy to judge when they need a drink. Just lift up on the pot and you’ll find the weight of a dry basket is noticeably different when the basket has been watered. You can also tell that hanging baskets need watering when soil is barely moist. Baskets and moss-lined wire cages can also be dunked in a large vessel of water to quickly revive them (IF they aren’t too far gone). Warm-weather veggies like tomatoes, peppers, eggplant, corn, melons, and squash do best when watered on a regular schedule. Sometimes rain helps, but during dry periods suplimental water is required. Inconsistant watering is the culprit of many bad crops. Plants suffer and won’t produce healthy fruit if they go from extremely wet to extremely dry. Prune shrubs and remove their sucker sprouts in the summer. As with most plants, keep soil moist but avoid over-watering, and apply mulch. If trees show signs of fading during the summer, use sprinklers and soaker hoses to efficiently water plants. Saturate the soil within the parameters of the tree’s canopy slowly and deeply by using a hose or leaving a sprinkler running for half an hour to forty-five minutes. Keep in mind, the symptoms of under-watering are very similar to the symptoms of over-watering and are often mistaken for each other. Grab a yard tool and dig down far enough to get an accurate assessment. Soil may be dry or staying too wet because of drainage issues. You’ll be thankful you checked in the long run.